I think an combination of elements escaping mars atmosphere and even hanging around for a brief period containing Hydrogen will show a blue tint especially water. post #16 image 3 has what looks like an ash tray about mid way up the left side of the image sticking out of the ground. The water traits are all over the mars images as sedimatary layers well worn and blown by time. post #25 the 8th image in the lower left corner you can see the rovers tracks that have been laid down in the lose soil. There are many rocks that are fractured by the climate cycle change of what was warm to sub freezing temperatures. What puzzles me is the blue hue to the sand and stones as to the element that will cause this. I know on earth that this is coper oxides that will do this but are there others? I took this screen image just before NASA removed it from this video online, (also including third party) you can still watch this one, but this part is frozen. Or the part showing live video of Curiositys decent showing a blue sky in the background, although the first image we got were b/w. Then color later on, showing virtually no blue sky. And the 2004 Spirit, Opportunity press release, (this cannot be found on any NASA sites) showing a blue martian sky. Quite ironically this image was reddened a few days later. And the first Viking images, before NASA got to them showed something similar. Overwhelming evidence that Mars has a sky like ours, but as to why NASA keeps up the act? Probably has something to do with the fact that you need at least 17% oxygen in an atmosphere in order to create a blue colorization. And Earth has around that much, so, it opens up a lot of doors. The rocks blue hue could be from lithium salts which under the blue sky would appear with the shadowing of blue. It was my understanding that NASA's first guess at colour balance was soon proved to be wrong when someone noticed that the apparent colour of some wiring on the rover was incorrect. When this was corrected the sky appeared pink. They have stuck with the corrected colour balance ever since. True, to a point, but there are also very reflective rocks showing a blue sky. 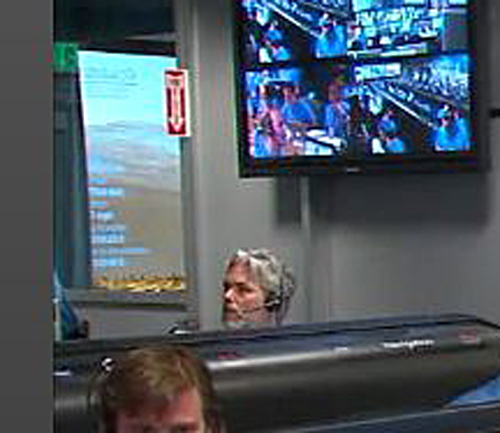 No, the first Viking images were correct, then NASA got spooked, and intentionally set all of the moniters to red. A tech, guy thought that that is incorrect and turned them all back, he was then chewed out and told he would be fired if he tried that again. Every single Hubble image showing Mars Always shows a blue atmosphere, as does any astronomer pointing their telescope towards mars, abeit more blurry. This stems back to the 1957 report on how would the US population react to news of alien life. And mass rioting, looting and such would ensue, so after NASA sent viking there not expecting anything and finding organics in the soil, a blue sky and green stuff on the rocks, they hushed it up. And have been doing so ever since. But they are also intentionally giving us hints, (monitor in other room, the occasional blue sky, and Hubble images) but giving us hints in a "if you don't want to know, then you can dismiss it" kind of way. But this is leading to full disclosure, which is inevitable, Elon Musks Mars satellite and probe, and then rover will blow the lid on all of this, and do so with HD images, instead of the crap we currently have to work with. Conspiracy no, l just follow the trail of evidence. And more rocks with green on them. well, small rocks. Mast Camera, (down the bottom). 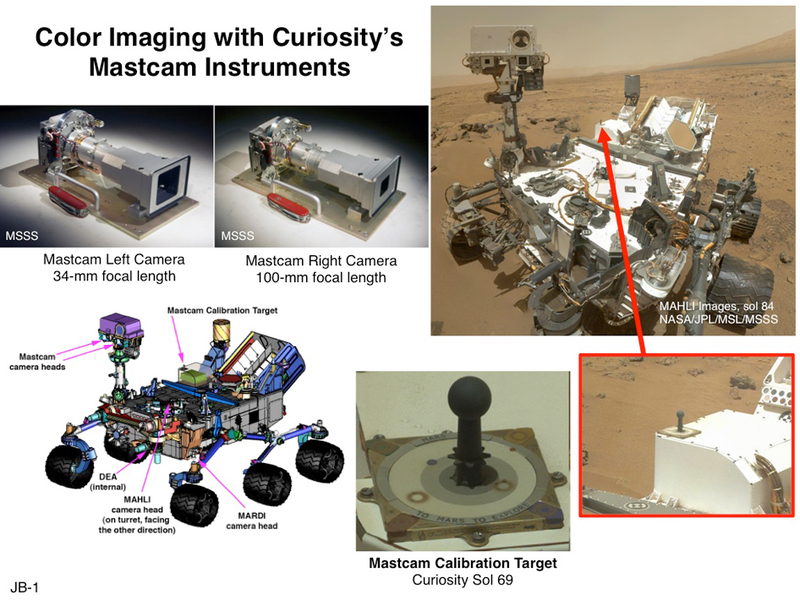 This set of images illustrates the twin cameras of the Mast Camera (Mastcam) instrument on NASA's Curiosity Mars rover (upper left), the Mastcam calibration target (lower center), and the locations of the cameras and target on the rover. The known colors of materials on the calibration target aid researchers in adjusting images to estimate "natural" color, or approximately what the colors would look like if we were to view the scene ourselves on Mars. 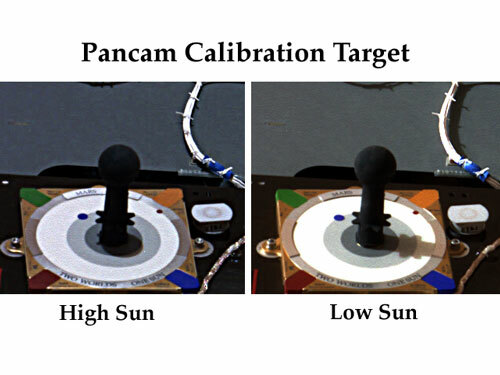 The design of the target is essentially the same as the color calibration target used for the Pancam instruments on the Mars Exploration Rovers Spirit and Opportunity. For Curiosity, the target was modified to include six small embedded magnets that can capture and concentrate dust from the Martian atmosphere. These are the reddish rings seen in the image of the target shown here, which was taken on Sol 69 of Curiosity's mission on Mars (Oct. 15, 2012). Using the calibration target on each rover, scientists have a good knowledge of how to adjust colors according to the circumstances found by the rover cameras on Mars. Scientists saved half of the material for the silicon colored chips on the calibration targets, so they can make comparisons and accurately measure how the rings and chips on Earth are reflecting light on Mars. Before sending cameras to Mars, the team took more than 100,000 pictures in a vacuum chamber on Earth that simulates martian conditions. They experimented with different levels of light entering the lens, depending on the angle of sun or amount of dust in the air. They then fine-tuned the cameras to respond correctly to temperature changes or anything else that might cause the instrument to vary. "It's crazy how many pictures we took with the Pancam on Earth, but those images were essential to finding the answers on Mars," Jim recounted. Using a "calibration target" with green, red, blue, and yellow silicon swatches and rings of varying shades of gray, the team monitored how those colors changed under different lighting and environmental conditions in the laboratory. Each rover carries its own calibration target, and is regularly instructed to take pictures of it. 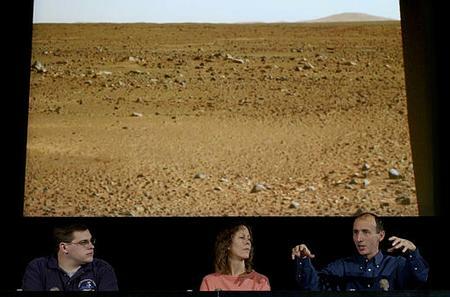 With their earth-bound experience, scientists have a good knowledge of how to adjust colors according to the circumstances found by the rover cameras on Mars. They know how much sunlight the three rings of gray, black, and white reflect on the calibration target in the different filters. They also saved half of the material for the silicon colored chips on the calibration targets, so they can make comparisons and accurately measure how the rings and chips are reflecting light on Mars. Through all of these color corrections, the unprocessed raw images are not affected, and no science is compromised. In fact, there are many interesting things that can be learned about the surface and atmosphere by studying how their colors change during or between each day. That's nice, and l guess that what you are saying is that all mars images are red, and blue sky ones are a fluke, which must mean all Hubble images have serious technical issues, since they all show a blue atmosphere? Eventhough NASA shares them with the media when they become available. I guess that means that NASA are stupid, lol. I have researched this to death,....! NASA has said they made a mistake with colour on their first lander: Viking 1 & 2. They corrected the colour using images of parts of the lander. Subsequent landers have a colour calibration target to ensure they don't make the same mistake. If you feel they still don't have colour correct, Ok. I've seen some images that are far deeper red that others, indicating they still have to watch the colour. 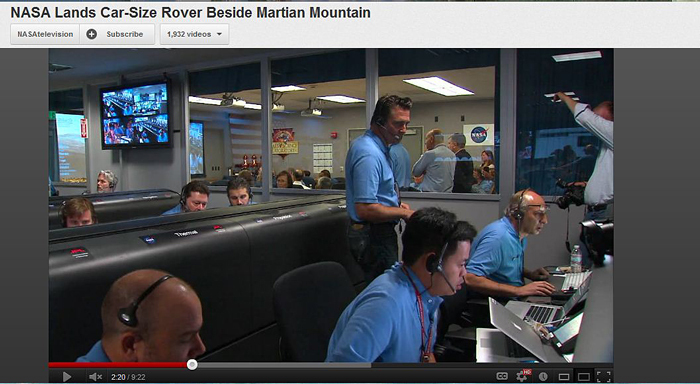 However, all 3 rovers record sunset on Mars, the sky is blue near the horizon, when the Sun is near the horizon. The reason is sunlight travels through more atmosphere. Hubble images will show atmosphere only on the edge of Mars, where light again has to travel through a lot of atmosphere. 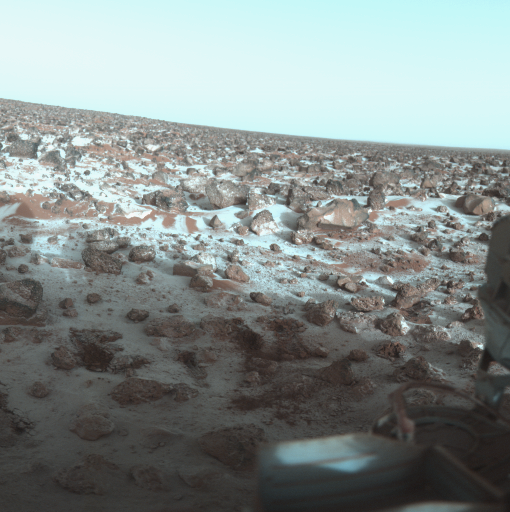 Images that have been colour correcting using a rover calibration target show the Mars sky is salmon pink near the horizon when the Sun is high in they sky, but the sky is much more dark and with a blue tinge directly overhead. Again at sunset, the sky near the horizon close to the Sun appears blue. So it depends which part of they sky you're looking at, and position of the Sun in the sky. The reason is Mars has a lot of fine dust in its atmosphere, which tends to tint the sky the colour of that dust. But directly overhead there is thin atmosphere, so not much dust. When the Sun is near the horizon, light is more direct from that direction, less diffuse. So stronger influence from gasses of Mars atmosphere, and from the atmosphere acting as a prism. Less effect from diffraction and reflection from dust. If you think NASA still needs to correct their colour adjustment, Ok. Have at it. 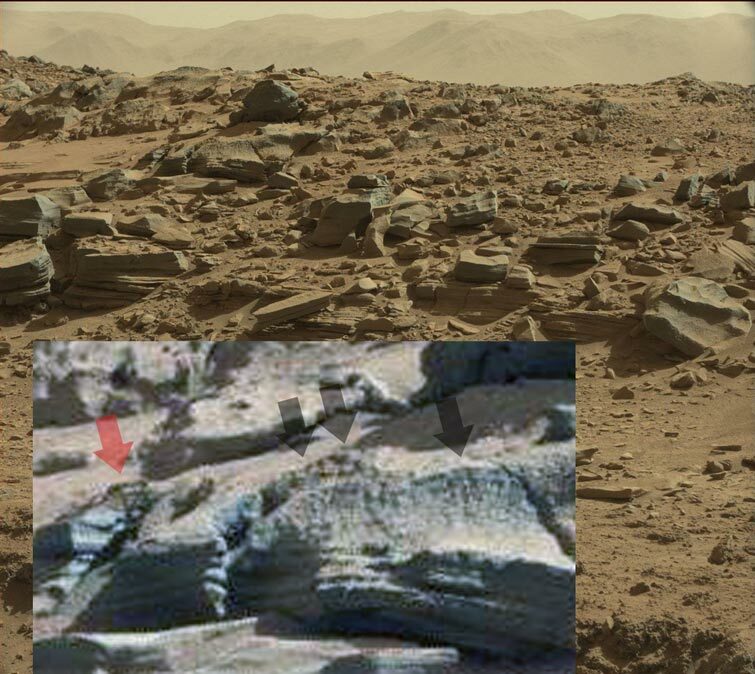 Ok, you partly got me there, l have not seen a mars sunset in reflective rocks, but have seen bright yellow/orange light in some of the rocks, so it is an educated guess. 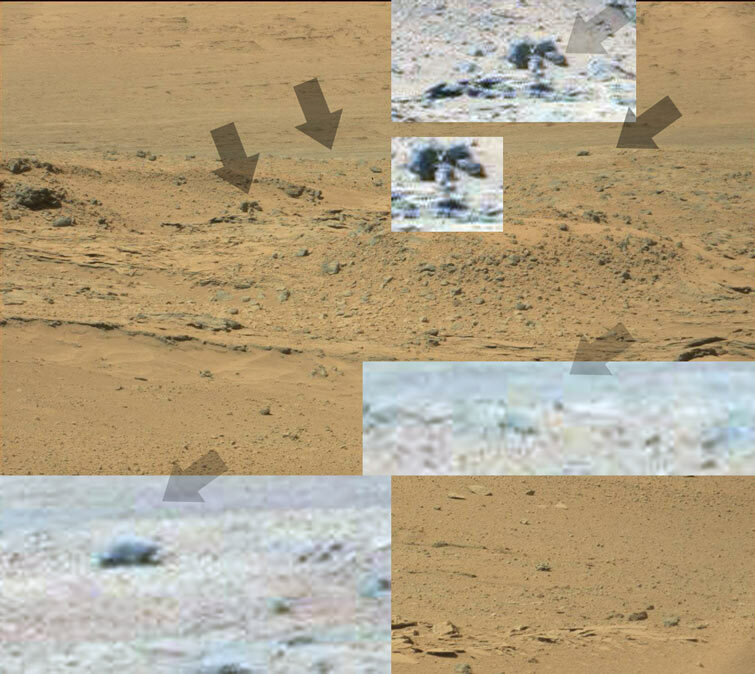 I know the fine dust point, Spirit and Opportunity, have about 20 years worth of images, some color ones are at ground level and some on hills, but None of their images show a blue sky. 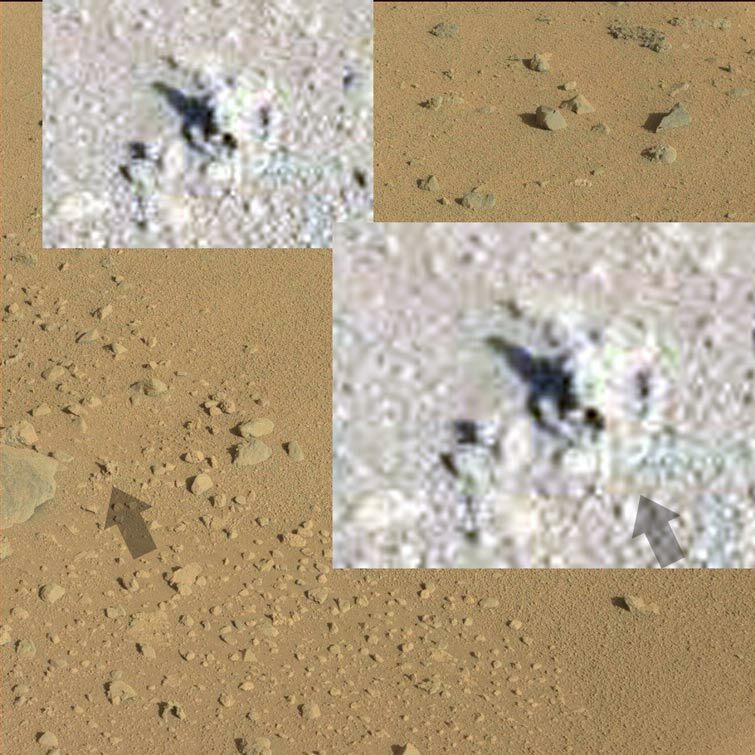 Curiosity lands there and several appear, after a few years there. Dust storms last a year on Mars at worst, so that cannot be used as a reason for the gaping hole in the blue sky issue. Neither is NASA's latest apparent fact that when Curiosity is on a hill then the blue sky is more obvious. 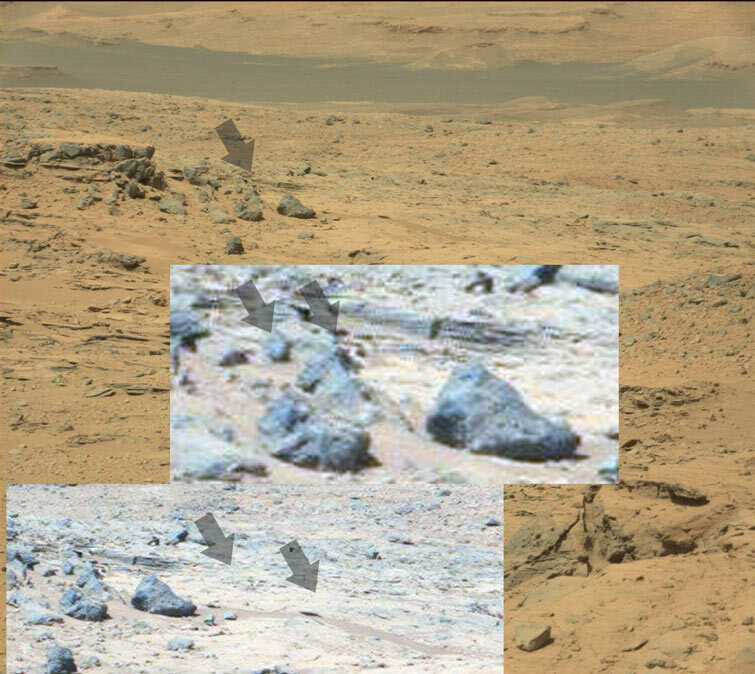 The other two rovers took a good part of their panoramic image's on hills, and they where all as red as ground level. As for the red filter being difficult, to get right, fair point, but look at Russia and the probe they sent to Venus. Temp, that can melt lead, and crippling pressures, but for the short time it was there, it took perfect color images of the landscape. Based on NASA, their images should have been yellow, since the yellow atmosphere, (3 times thicker than ours) is yellow. Another glimpse of how Mars really looks. The clouds or sky are hard to make out, but the blue/purple mountains, (that mars isn't supposed to have) and green on the landscape that mars definitely isn't supposed to have are clearly visible, (well, the colors are). Curiosity has no green on it, so it isn't coming from there. 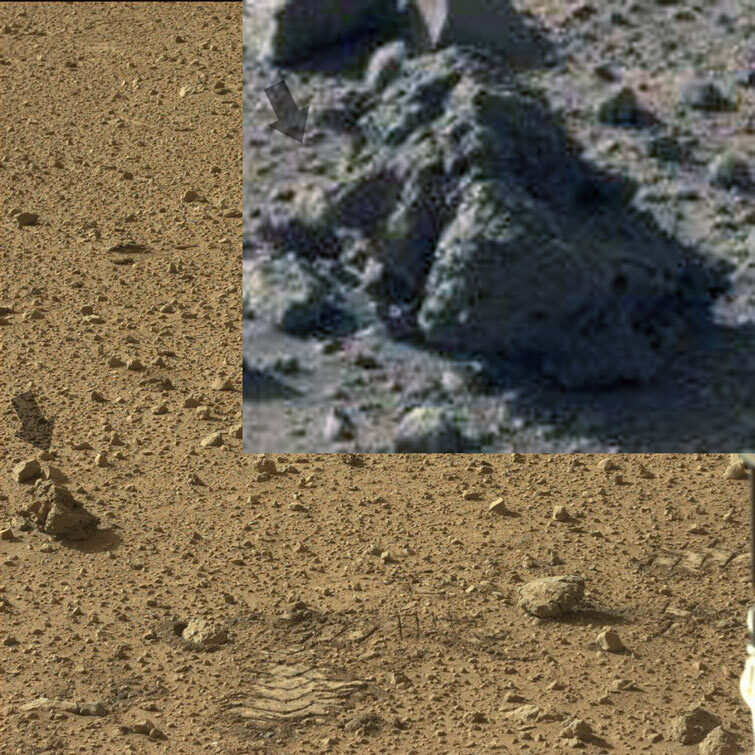 The thing on the right is Curiosity or part of it. Very high chance that Saturnian crabs and such are on this small moon a billion miles further away than Mars is from our sun. Mars is in the habitable zone, and Hubble, early Viking images are at odd's with NASA data and most of its images! Or maybe it is all of the Mars sci fi movies that are giving some the willies about this subject? Best to let real evidence dictate your beliefs, or when NASA finally owns up, you will be in a room with many, but there is no safety in numbers for his one. Someone came across this recently.. Most of this can be dismissed although intriguing, but the white fungus on the wheels, strongly implies moisture. I know you can still have salty moisture, but since Mars seems to have so many puddles about, rain also seems to be likely. You cannot have salty or saline rain! Not sure what this is, a handle of some kind at best guess? I don't believe that it is Curiosity's reflection. Just got lucky that this image was next, (relates to the court case) and shows that the soil Curiosity is going over is damp. Impossible to get clumping like this with bone dry soil, (some moisture has to be present). 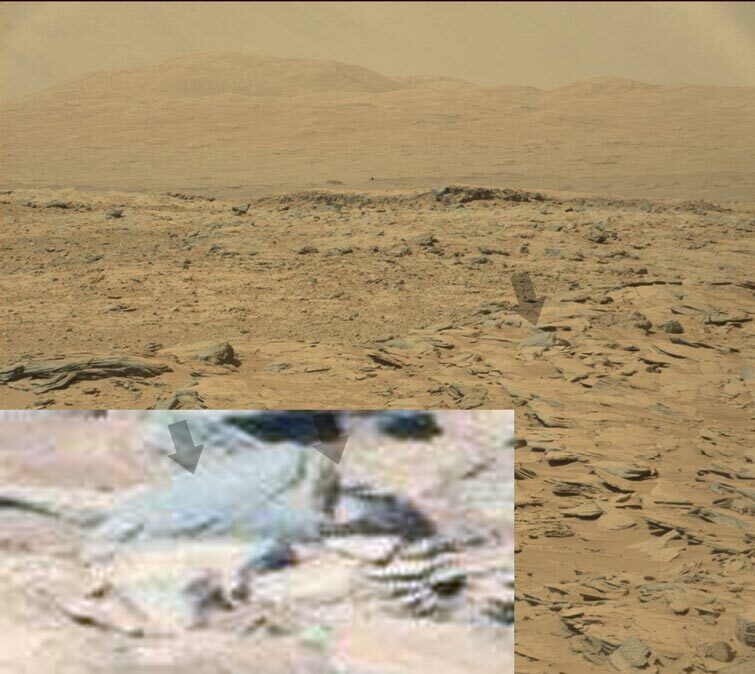 So Mars has a blue sky, moisture in the soil and green stuff all over the place, sounds pretty dead to me. 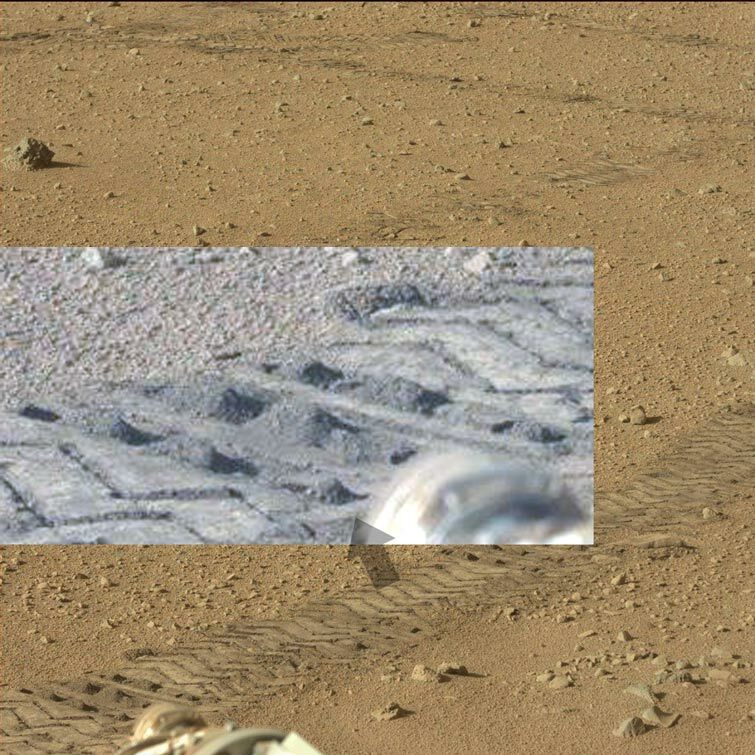 Nice tire images in the soil but the sharp edges are possibly just how the soil compacts as one of the topics for mars recently indicated that its good for a thin 1 inch thick brick via compression/ compacting of it by just a small mass. True, to a point, compression takes place on the moon as well, and all of the edges are sharp, (first step on moon) due to very fine particle compression, but Mars with much larger particles, less likely. This reflective rock shows part of the rover, but also shows since the sun is setting that creamy clouds are also present. Hopefully the images will continue, before sunset, and l add some more evidence to the orange/red sunset, similar to Earth. 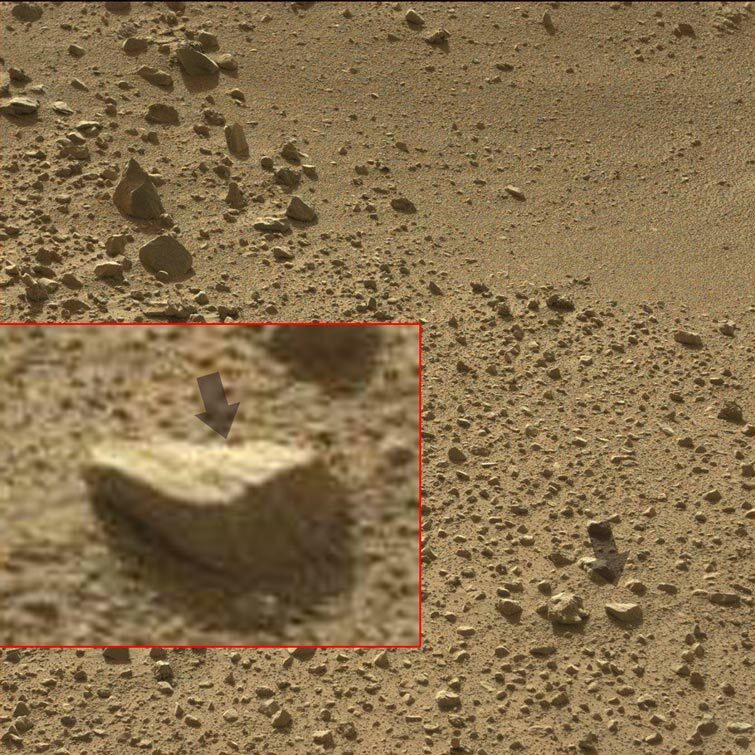 Finally we see one of these weird rectangular, very reflective rocks on its side. Impossible to tell if this is artificial or not. There hasn't been much lately, but this caught my eye. The rover has turned around so the sun is at a different angle. 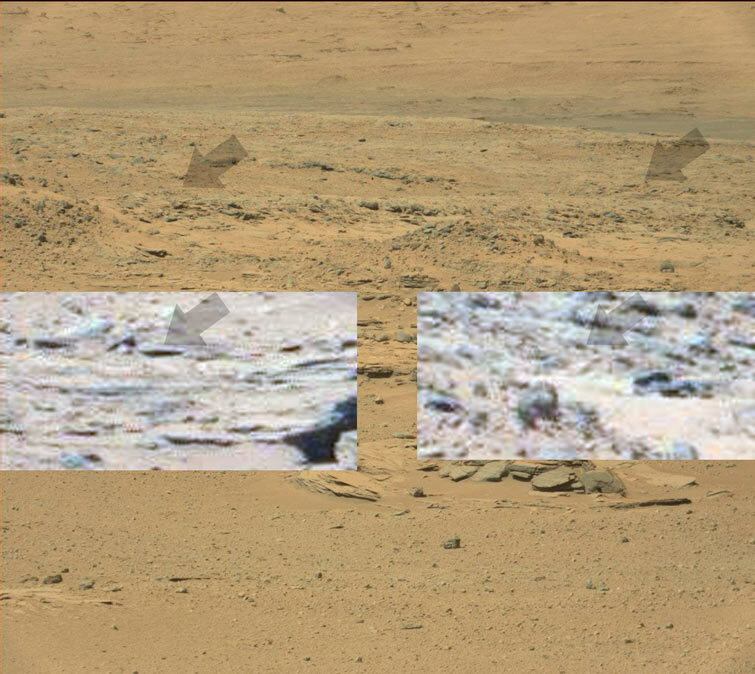 But this reflective rock still shows the rover, (arrow) the green tingle that should not be there, and the martian clouds. I know that these are clouds since the rovers mast cam is in front of them, and they look dark underneath, (dark clouds, rain)! More to come when l find anything worth posting. Maybe this is nothing or more writing, and pictures? The red arrow eventhough looking like an artificial object is actually part of Curiosity wheel section, being reflected back, (the black thing on the left is the wheel). Thank's for that information Spacenut. Kind of hit the jackpot today. This isn't Curiosity's reflection, and is a machine of some kind. Since it is near the water, (next image) it probably has something to do with that? 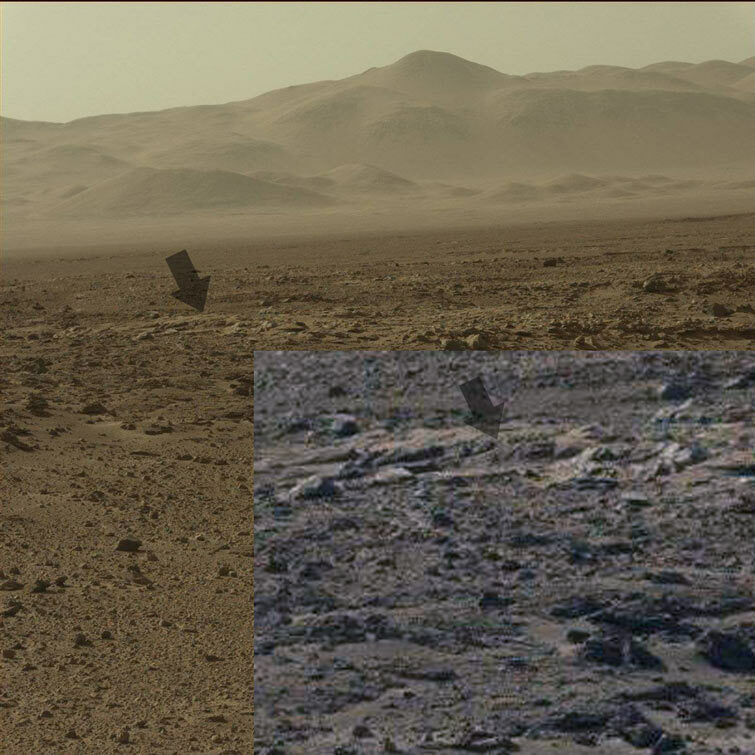 There is also what looks like a structure of some kind, (bottom image) and some dust being thrown up by something in the distance, eventhough there is no dust movement anywhere else, hinting at something moving about. Second image shows water, or a stream, hard to see, but it is there. 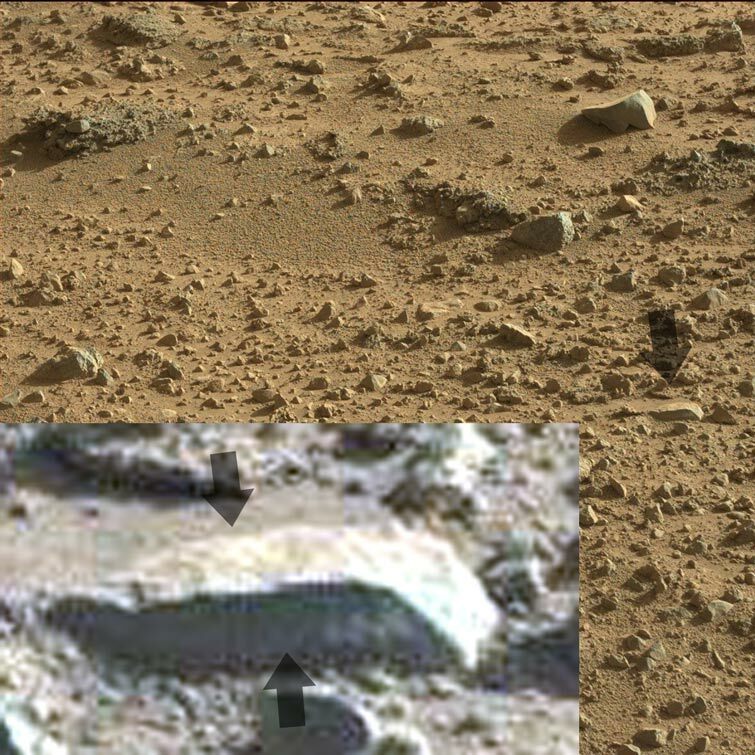 Another rare image of Mars reflected back in a rock. Curiosity is on the right, and the usual blue mountains in the distance and blue sky on the left. 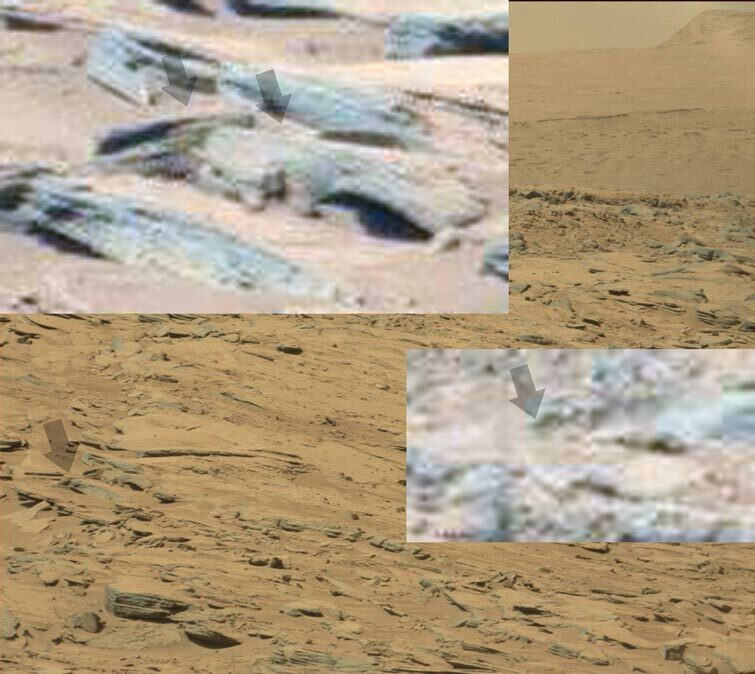 There also seems to be some metallic cylinders in the side of the mountain, (water storage, most likely). 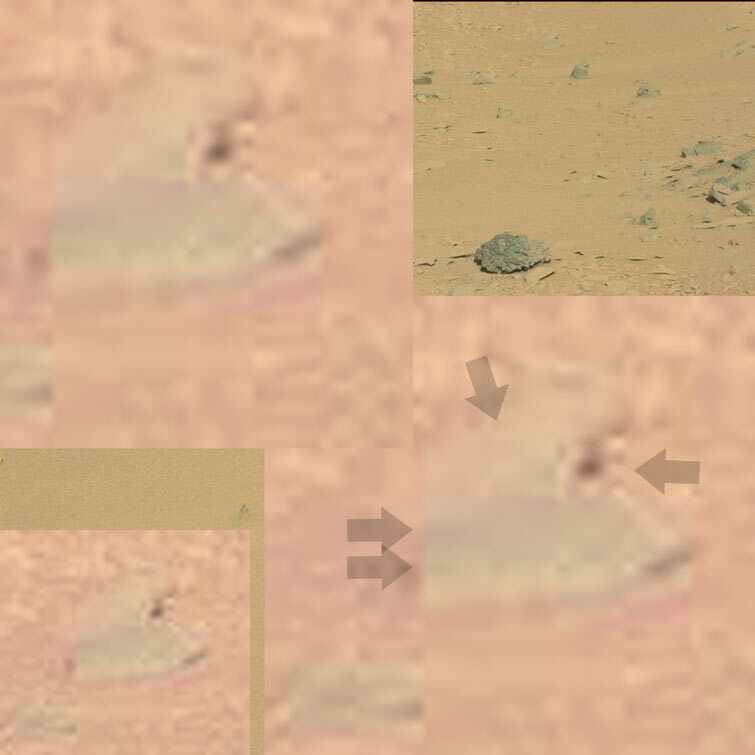 Top image Curiosity being reflected back l think and more green stuff, that should not be there, the rover certainly didn't come with it. Lower image, a pool of water, and Curiosity wheels being reflected back. The other interesting point is l was hoping to get a glimpse of some yellow or orange on the landscape in the last few images but Curiosity stops taking shots when the sun is setting, eventhough it is nuclear powered! Appears to be an old water pipe of some kind, and probably not abandoned, considering the wet trail of soil leading from it. 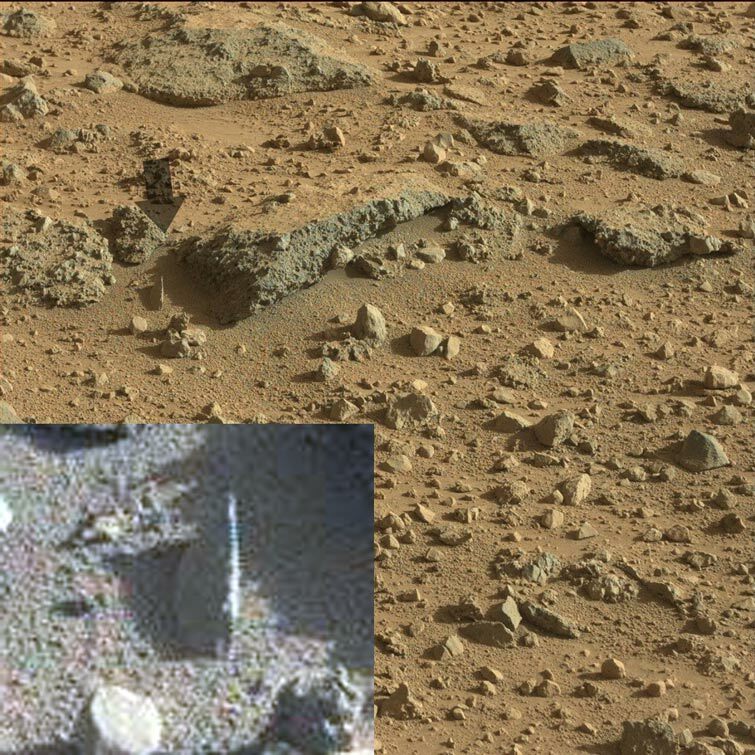 The steel pipe tends to be straight and then curve on an angle, and l don't believe that Curiosity's reflection plays a part in this, since the landscape behind this, is present, (not the martian landscape, and blue hills, as we usually see).